The following accounting of Advanced Composites technology is not intended to be exhaustive, but is meant to offer a snapshot of our composites design, manufacturing and prototyping capabilities. A robust composites manufacturing framework. The Advanced Composites Inc. facility boasts a range of composites production technologies, from prototyping equipment to machine tooling to fabrication machinery. With our recent expansion, we enjoy nearly 40,000 ft2 of production work-space and nearly 10,000 ft2 of office, recreational and inspection space. For shuttling products and materials around our facility, Advanced Composites has three overhead cranes, each with fifteen ton lifting capacity, as well as multiple jib and gantry cranes. We also have custom tooling trays, curing carts, forklifts and an extensive system of tool storage and organization. For the machining, turning, finishing and shaping of composite structures, Advanced Composite runs a multitude of sophisticated machinery, much of it CNC (computer numerical controlled). Our machining lineup includes a 5-axis CNC mill with vertical machining center; two 3-axis CNC mills, including one with vertical machining center capable of 84″ x 32″ x 30″ travel; two manual mills; four CNC lathes; three manual lathes; four wet centerless grinders; one custom through-feed diamond dry grinder and sander with inline part washer (for tubular composite products); one through-feed diamond belt wet sander (also for tubular composite products); multiple cutting benches with diamond tooling; lastly, a full roster of metal-working equipment: MIG, TIG and gas welders, a plasma cutter, surface grinders, oxy-acetylene torch, and more. ACI has an extensive finishing facility for our composite products, including containment-free painting booths, a painting tower for long items, a metals polishing station, several enclosed stations for the sanding, centerless grinding, center grinding, diamond cutting and sandblasting of components. Advanced Composites also has extensive bonding capabilities for all composite structures with the ability to bond them to most substrates. Advanced Composites operates four long bed filament winding machines, of the two-axis and three-axis variety. These filament winders accommodate structures up to 32′ long and 48″ in diameter. Additionally, we have a short bed filament winder with four axes, capable of accommodating objects up to 12′ long and 24″ in diameter. Four multi-spindle filament winding machines round out the ACI fleet. With ten spindles each, these can handle structures up to 12′ long and 6″ in diameter. Advanced Composites maintains an inventory of over three hundred filament winding mandrels. These cover all of the most commonly-encountered sizes specified for filament wound projects, and range in diameter from 1/4” to 48″. In the rare event that we need a mandrel size that we lack, we have rapid-turnaround capabilities for mandrel production. For filament winding projects that necessitate a controlled environment, Advanced Composites maintains two ISO Class 9 rooms, each with controls and logging for temperature, humidity and particulate levels. Curing ovens for filament wound and molded composite structures. Advanced Composites operates seven ovens. These operate up to 500° F and feature vacuum bagging equipment and multi-channel NIST traceable data logging. 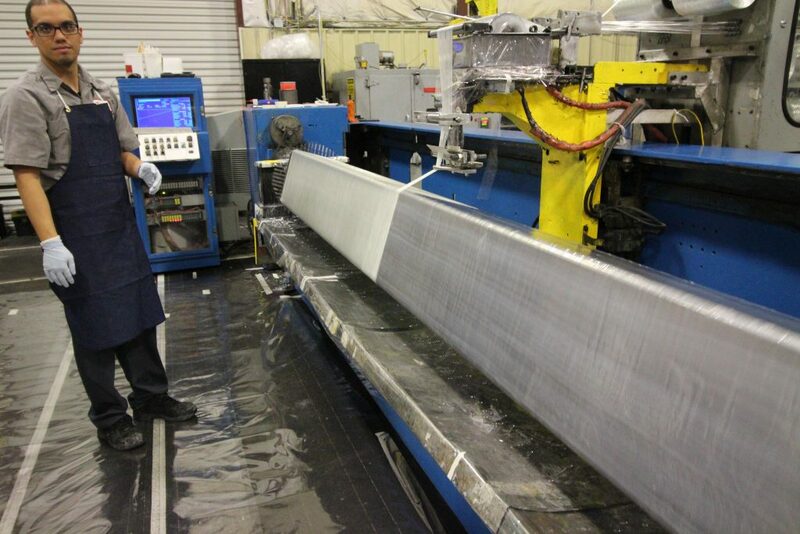 Our composite curing ovens vary in size, with the largest ovens having 8′ x 8′ x 32″ capacity. Before, during and after composites manufacture. Before a product enters production, Advanced Composites Inc. must model, designed and prototype it. After manufacture, the product meets a battery of quality assurance and inspection protocols. For these preliminary and final phases of the creation lifecycle, Advanced Composites Inc. has state-of-the-art modeling and analysis tools for designing and for quality assurance of composite structures.